Make yourself seen and heard by everyone with our deaf and limited vision services. Our team of highly skilled interpreters and text captioners offer a range of ISO-certified services – both on site and via remote video calls. ASL is a rich visual language with its own unique syntax, grammar and sentence structure – completely independent from the spoken word. A diverse range of handshapes, palm gestures, hand movements, facial expressions and body postures allow culturally deaf audiences to understand the richer complexities of a language they cannot hear. PSE is a combination of ASL and English, ideal for the hard of hearing or people who develop deafness later in life. In such cases, English has already influenced the linguistic makeup of an individual and PSE can range from being more similar to ASL or English, depending on the needs of each person. It’s also an incredibly quick form of sign language because it drops unnecessary words and word endings – not only making it easier to learn but better suited to environments where interpreters need to keep pace with spoken English. SEE also draws upon signs from ASL, but adds words, prefixes, tenses and other features of English to round off a complete visual representation of the language. SEE can be much easier for hearing parents teach, learn and use, while it offers a more colorful and accurate representation of English. Tactile and close-vision interpretation is for individuals with some degree of both vision and hearing impairment. Tactile signing uses ASL signs or finger spelling on the hand(s) of the deaf/blind person, while close-vision interpreting involves signing at a distance suitable for partially sighted individuals. For those who rely on lip-reading, our interpreters are also trained in oral interpretation and transliteration. Oral interpretation requires a clear articulation of the mouth (without voice) while transliteration adds signing for those with varying abilities to read lips and sign. When deaf or hard-of-hearing individuals can read and understand English, it’s sometimes more appropriate to use captioning on a laptop, mobile device or large screen. 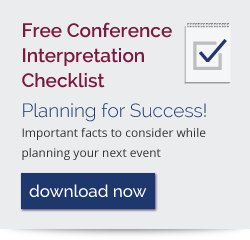 The is particularly useful for presentations, workshops, training courses and a range of events. Remote captioning offers the same service as text captioning – except via the internet – using a remote interpreter to caption an event over a live audio feed. Captions are delivered to the recipient’s computer or laptop; the only requirement is a high-speed internet connection. Braille is a system of raised dots that represent both letters and punctuation for more than a hundred languages around the world. This provides a tactile means of “reading” a document for the blind or partially sighted, while braille graphics such as line drawings and maps can also be produced. Our braille transcribers can translate into foreign languages, down to accented letters and unique punctuation of different alphabetic languages around the world. We can also transcribe into braille systems for languages that don’t use the Latin (or Roman) alphabet – including the most complex Asian, Eastern European and African writing systems. If you’re in the medical, education or another sector that needs industry expertise, you can see which fields our ISO-certified interpreters have extensive knowledge and experience in by visiting our industries page. Or to learn more about our sign language services, you can take a look at our blog page.